Assessing the social role and responsibility of a bank is not an easy task. A financial institution is by definition a complex organisation and for those who do not know its operation it is not easy to understand its role in society. Therefore we shall give a short introduction of the bank balance sheet. As is the case with every company, the balance sheet of the bank consists of two parts. The left-hand side or the assets side shows the possessions of the institution, the right–hand side or liabilities side shows the debts. In the annual accounts, under those two sections, we find the profit and loss account, which specifies the profit or loss and shows how the result has come about. On the assets side of a bank balance sheet the careful reader will see how many loans the institution has issued, which bonds it has in its portfolio and how many structured products it offers. The value of the buildings is also stated in it, as well as the goodwill. To put it simply, this last item tries to put a figure on the value of less material possessions like reputation, growth potential or a brand. 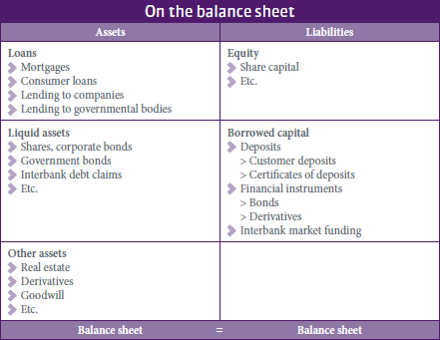 The balance sheet total is the sum of all assets (as well as all liabilities). To the right of the assets is the list of liabilities. At the top, the equity appears – i.e. the debts to the shareholders. In principle the equity is money that a bank can dispose of immediately. Under the equity appears the borrowed capital. The savings (deposits) of the customers are part of this, but also the money, for instance, that a bank borrows from the central banks and on the financial markets to fund its balance sheet. The ratio between the equity and the balance sheet total (in fact, therefore, the number of times that a bank has lent its equity in the market) is called the leverage. The balance sheet total of a bank is not by definition stable – not even if a bank does not purchase or sells assets. The reason is that the value of the assets is subject to change. A building may increase or decrease in value, the value of a brand may increase or decrease. The international IFRS accounting rules provide that a bank must take those fluctuations into account for a specific part of its possessions. Broadly speaking, on the assets side of the bank balance sheet we find three categories of ‘financial’ possessions. Long-term loans that will remain in the books until the maturity date (e.g. mortgages for thirty years) must, in accordance with the international accounting rules ‘hold to maturity’. That means that they will remain in the books at purchase price until they are paid. If, for instance, the house linked to the mortgage increases or decreases in value, that value fluctuation will not affect the balance sheet total of the bank in any way. The assets in the trading portfolio, however, are meant to be resold as quickly as possible. They appear in the books at day value. Usually no sustainable long-term funding is required to keep them in the books, because in principle they will be sold on quickly. In-between those two categories there are financial possessions that are booked as ‘available for sale’. These are assets that the bank may maintain until maturity, but may also sell them before that. A major part of the assets of Belgian banks (for example. many government bonds) has been placed in the last category so that the financial institutions have their hands free should a buyer make an interesting bid. The consequences of that choice have become clear during the crisis. The market fluctuations of, for example, government bonds became (and become) immediately visible in the books of the bank because of the accounting rules. If the market price of Spanish government bonds collapses or if the banks decide to devaluate their Greek sovereign debt to 30% of its nominal value, this creates a problem for the banks that have such bonds in their available-for-sale portfolio. Then the value of those bonds decreases in the assets column of their balance sheet and that value reduction must then be made up for from the bank’s equity. When a bank eats away at its equity from the right-hand side of the balance sheet, it must supplement that equity immediately so that it complies with the capital requirements and remains solvent. When the financial crisis caused the bottom to fall out of the share markets, the government was often the only party that was prepared to buy in the (share) capital of a financial institution in difficulty and thus to make up for the deficit that had come about in its equity due to the decrease in market value of the assets. However, market value is by definition virtual: it reflects a price that the market players are willing to pay for a financial product at one specific moment, but does not necessarily reflect the real intrinsic value of such a product. The lack of capital, however, was not the only problem that certain banks had to cope with during the crisis. A serious liquidity problem also threatened because too many assets were refinanced over the long term in the balance with short-term loans on the financial markets. When the financial markets closed off the money supplies, this leverage caused serious problems for a number of banks. Before the Basel III capital rules, the equity of a sound bank was between 3% and 6% of the balance sheet total. That means leverage between 17% and 33%. Now that the central bankers at the Bank for International Settlements in Basel have decided to tighten the capital rules for the banks, the equity will be increased significantly in the next few years and the leverage will be phased-out. In Belgium that has already happened. The balance sheet total of the Belgian financial sector has been reduced by nearly 30% in the last five years. The dependence on the financial markets has decreased and the duration of the funding has been extended. There is therefore less to be refinanced, and the need to call on the financial markets is less frequent.